A top Management and Security Consultant, Dr. Ona Ekhomu has called on Universities in the country to help in bringing to life, the identification of physical evidences which could help to reduce crime and criminality in the country. He made this call while delivering a lecture titled, “Utilization of Forensic Science In Reducing Crime and Criminality In Nigeria” at the Opening Ceremony of the 2nd DNA Fingerprinting Workshop, organized by the Genomic Group, University of Agriculture, Abeokuta, in conjunction with the Institute of Food Security, Environmental Resources and Agricultural Research (IFSERAR); the Department of Biotechnology, India; Third World Academy of Sciences, Italy; and the Centre for DNA Finger-Printing and Diagnosis, Hyderabad, India. Describing the University as a place where information and facts, pertaining to evidences could be ascertained, he beckoned on Universities to help in bringing to life, the identification of physical evidences and also help in organizing programmes that could reduce crime and criminality in the country. Dr. Ekhomu, who defined Forensic Science, as the use of science to enhance the probative value of evidence said it could be useful in criminal prosecution, civil litigation, wrongful discharge matters, establishing innocence, among others. The Consultant therefore cautioned that professionals only, should be engaged in Forensic Science and that people should not use it to implicate other citizens. He also admonished Police detectives to desist from confession-led policing, but embrace the evidence standard method, in order to reduce crime and criminality. Giving some tips on how to reduce crime, Forensic culture should be created for Police agencies; new crime scene procedures should be established; judges should be made to appreciate Forensic Science; citizens should not disturb crime scenes, among others, he stated. 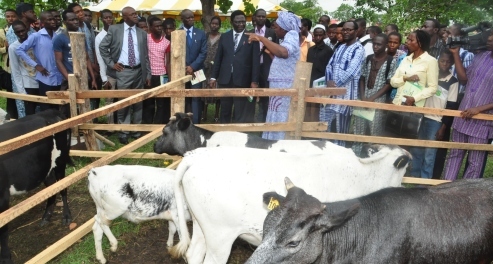 In his welcome address, the Vice-Chancellor, University of Agriculture, Abeokuta (UNAAB), Professor Oluwafemi Olaiya Balogun, expressed satisfaction with the workshop, declaring, “you will agree with me that organizing this workshop is in fulfillment of the mandates of the University, particularly, taking the “gown to town”. “It is expected that through this medium, the University will be assisting government, not only in providing awareness and educating the people on the various applications and benefits of DNA analysis and its likely effects in crime prevention, the Workshop will also pro-actively look into some likely problems of DNA finger-printing applications.”, he added. Represented by the Deputy Vice-Chancellor, (Development), Prof. Segun Lagoke, the Vice-Chancellor described Deoxyribo Nucleic Acid (DNA) Finger-printing as a technique which can be applied to virtually every aspect of human activities. In her remarks, the Chairman, Local Organizing Committee (LOC), Prof. Elizabeth Balogun, disclosed that the workshop was organized, in order to adequately train manpower that will domesticate and indigenize the technology and make sure that the benefits of genetic finger-printing reached the society. The ceremony also had in attendance, resource persons from the All Indians Institute of Medical Sciences, New Delhi, India; Dr. Anupuma Raina; the Director of the Biotechnology Centre, UNAAB, Prof. Okanlawon Onagbesan and the Director, Institute of Food Security, Environmental Resources and Agricultural Research (IFSERAR), Prof. Segun Osinowo.